Ice and snow equal slick surfaces. This, in turn, can lead to slips and falls by both employees and customers. Avoid these conditions by removing ice and snow as quickly as possible from all exterior walkways. Create areas near entrances to help people remove moisture from their shoes. Keep an eye on the floors throughout your buildings to make sure that wet conditions are being quickly dried. It may be wise to use electric fans and heaters to quickly evaporate water from hard surface floors. Many companies have employees who must work outside for some portion of the day. This may be to load or unload trucks, make deliveries, or because all services are offered outdoors. Whatever the case, it is important to ensure that employees are adequately equipped to deal with the cold. This might mean giving employees cold weather gear to ensure they are properly attired. It should also mean creating policies regarding how long one can be outside and training employees to recognize the symptoms of hypothermia. Driving in winter conditions can be one of the primary sources of concern for businesses. 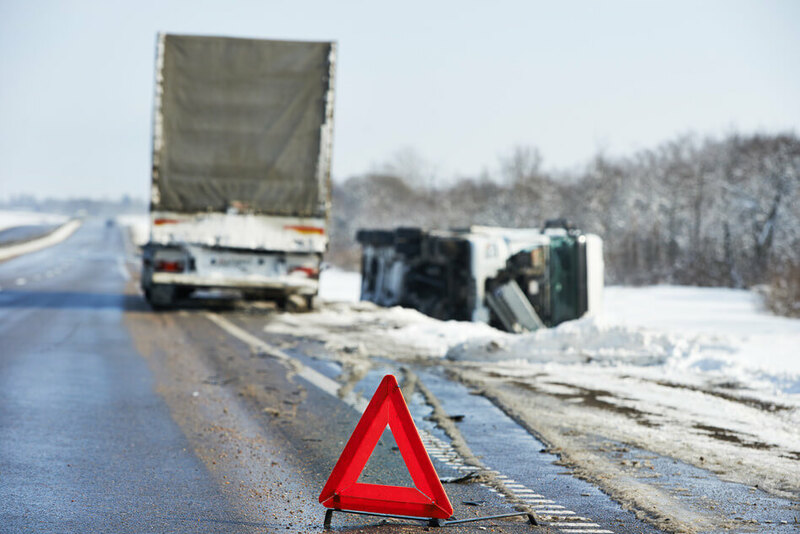 Slick roads can cause employees or other drivers to lose control and have an accident. Ensuring that employees who drive company vehicles have adequate training in operating a motor vehicle in icy conditions can help, as can using tire chains. Reducing speeds, allowing greater stopping distances, and avoiding congested driving conditions are also good ideas. Ensuring proper vehicle maintenance, such as adequate levels of antifreeze and proper tire inflation, are important to ensure the vehicle itself is not the cause of trouble. The best option of all is to try to minimize business related driving during icy conditions as much as possible. After all, other drivers can lose control and impact a company vehicle as easily as an employee. To avoid damage during winter storms, preparation is key. Have snow removal equipment readily available, ensure it is in good working order, and top off fuel levels in any gas powered devices. Once conditions permit, begin removing snow and ice as soon as possible. Clear walkways to allow access and avoid slips and falls. Also, be sure to clear roofs as quickly as possible; snow can add tons of additional weight to the roof of a building and lead to collapse. Use a deicing agent on walkways and roofs as a preventative measure, but do not rely on it as the exclusive remedy. Plumbing is another major source of concern. Be sure that even unoccupied buildings do not drop below 40 degrees Fahrenheit or pipes may begin to freeze. When water freezes in pipes, it expands and can rupture the walls of the pipes, leading to serious flooding and other damage. Make sure pipes are well insulated, inspect regularly for any leaks, and repair any areas of concern immediately. Create transition areas near building entrances to help dry the feet of anyone entering the building. Monitor floors carefully to ensure that moisture has not accumulated, and if it does, remove it immediately. It may be wise to use heated floor dryers to minimize risk of slips and falls between cleanups. Establish a plan to handle the cold weather related problems before they arise. This should include taking preventative measures and establishing policies in cases of emergency or weather-related interference with business. For example, devise a policy for closures in the event of dangerous weather conditions. In areas where it is simply a given that weather will interfere with business, develop delayed openings, early closings, or vacation weeks. Be sure that all of your employees are aware of your cold weather policies and that you have contact information for each of them in case of emergencies. Also, notify your customers of any planned changes in hours, and alert them in the event of an emergency closure. Keeping open lines of communication will help prevent disappointing customers or frustrating employees trying to get to work. Though rarely used, ensure that all emergency safety features, like fire access doors, hydrants, and fire escapes are in good operation as well. During an emergency is an awful time to discover that winter conditions have damaged one of these life saving features. If an incident does occur, have policies in place to address it. Immediately assist anybody that might be injured, never admit liability for the accident, and train employees in properly documenting the incident (including taking photos and getting witness statements). Have insurance information available and report the accident to your insurance company when appropriate, following any directions they may give. While there is no way to absolutely prevent damage, accidents, or losses during winter conditions, following these steps can help to reduce your chances and mitigate any damage. To get the most from these tips, take action now, before anything has occurred. This should help keep your business open and productive as long as possible during the winter, avoid losses to damage or injuries, and ensure the health and well-being of your employees and customers.